About 2 years ago I built my new PC, and I wanted a led-lighted keyboard. 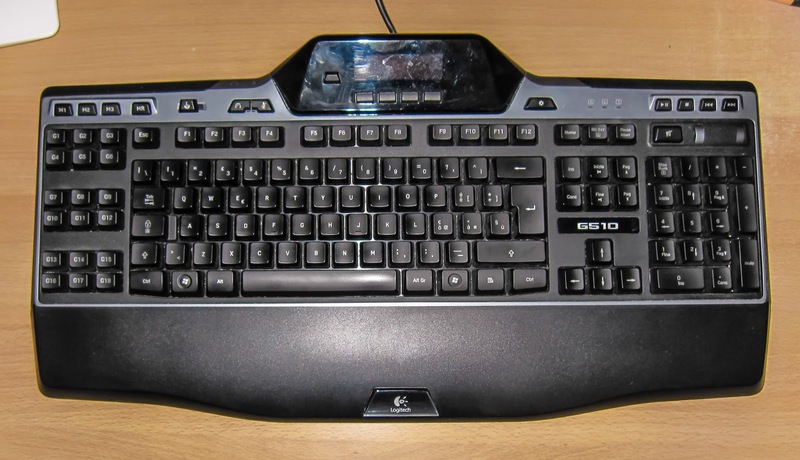 And the G510 was the only keyboard (with a decent price) where I can choose the color of the keys illuminations. I simply wanted to have white lighted keys... and the majority of lighted keyboard have all sorts of colors but the white. 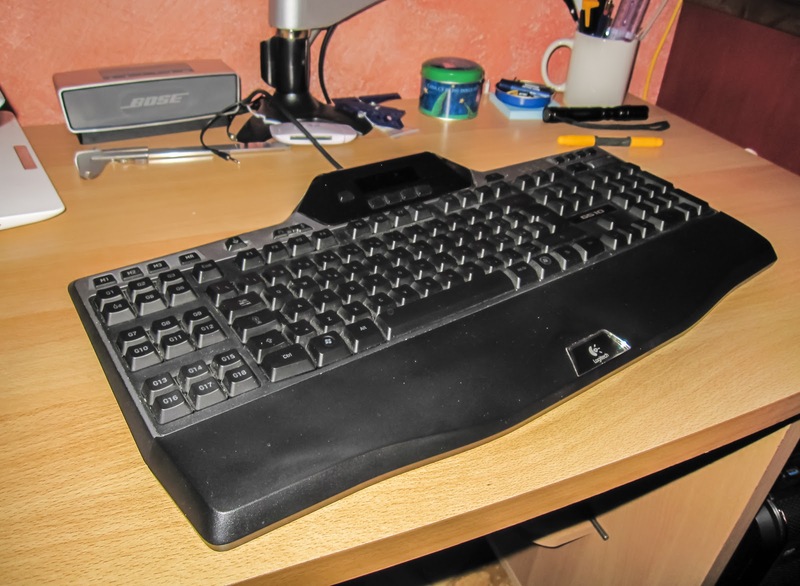 I knew, from the reviews I read, that the brightness of this keyboard isn't very high, but it still does the job. I haven't had any issue in seeing the keys.. I just think it would be esthetically nicer if the keys had a bit more brightness. 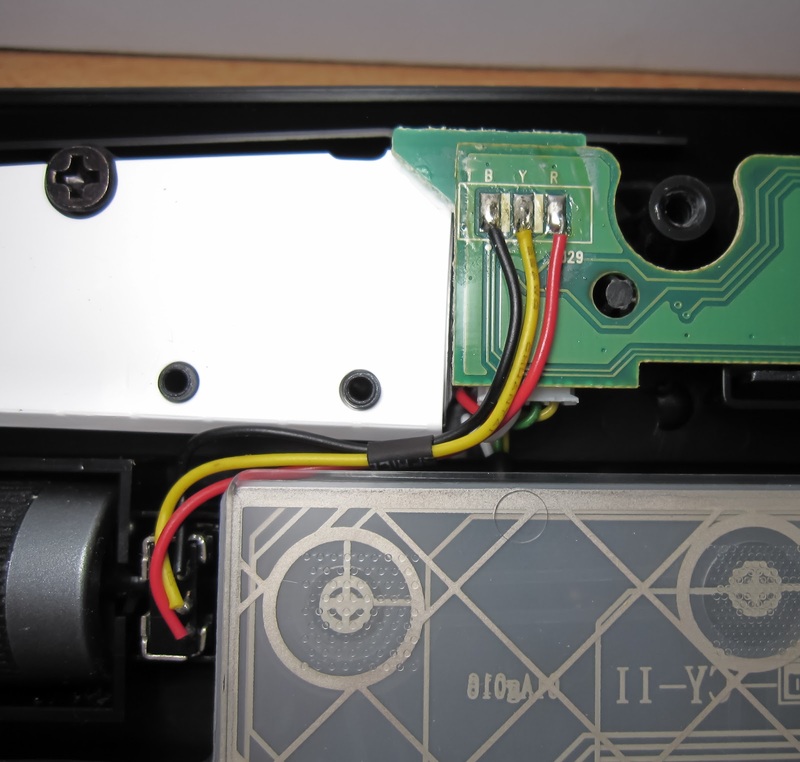 So, mainly out of curiosity, I decided to take the G510 apart, just to see how the keys are illuminated. Here we go with some photos of my G510. 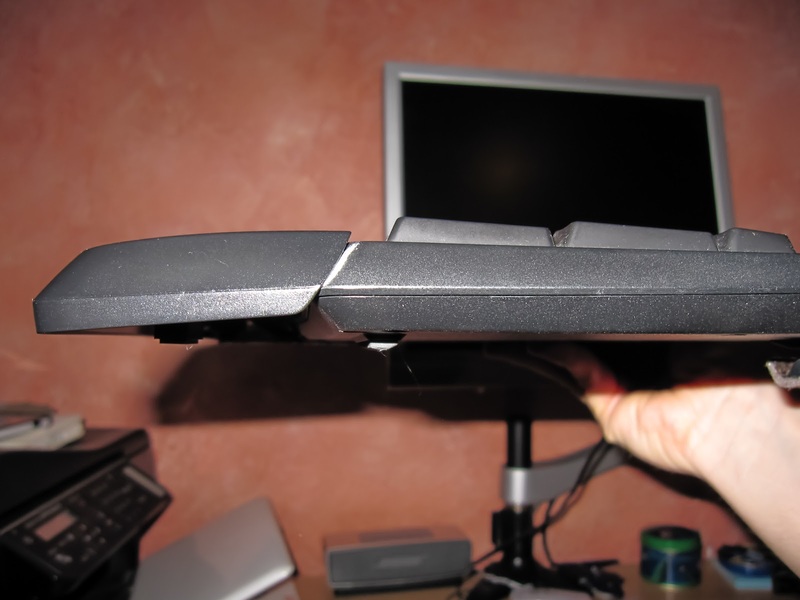 While we are at it, the G510 palm rest could have been projected in a better way. 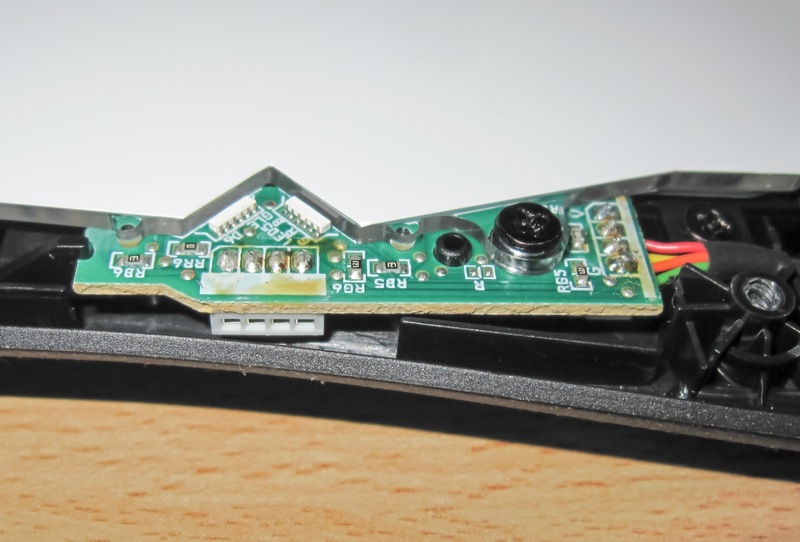 The following image (from the Logitech G510 Review of www.axonnsays.com) explain very well the issue you'll have with this palm rest. 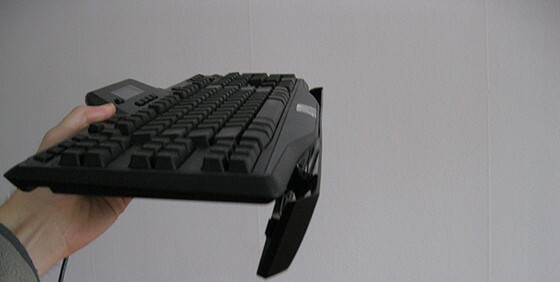 You need to use 2 hand each time you need to move, or lift, the keyboard, this is very annoying. 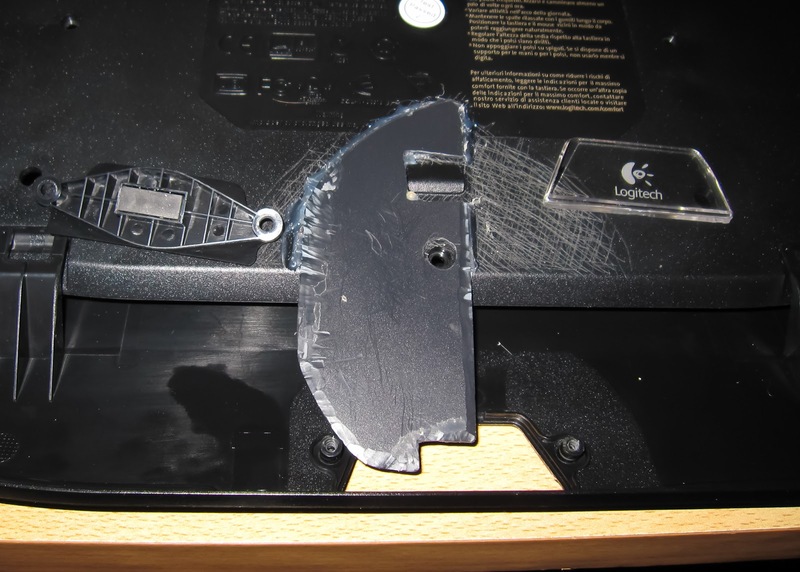 Here is my fix: a glued piece of plastic that will keep the palm rest in line with the keyboard. 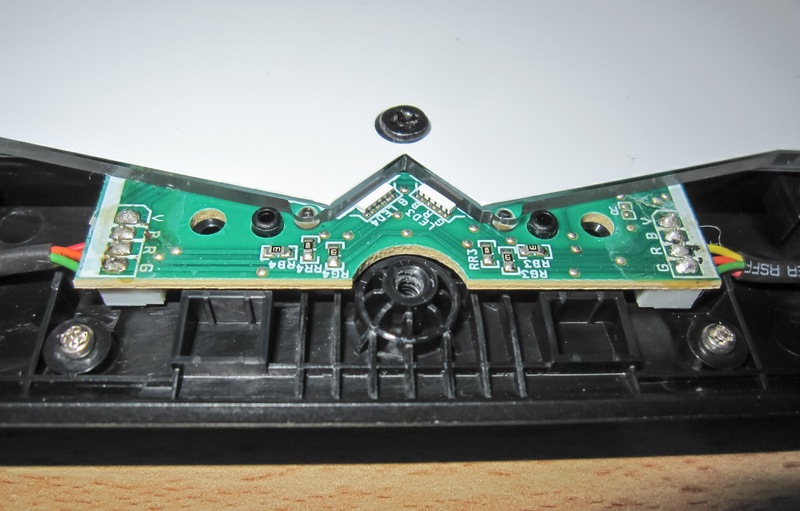 The strange shape of the piece of plastic is due to where it came from: a CD jewel case. 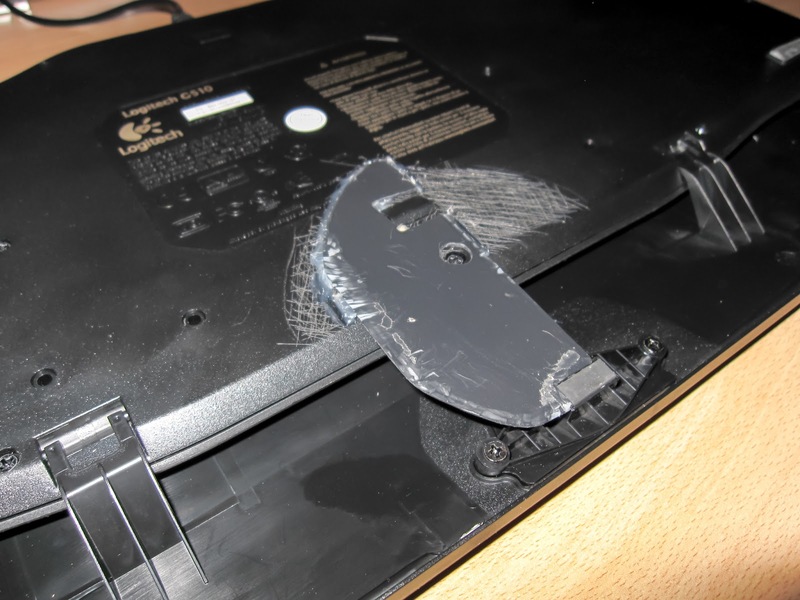 The plastic is glued with hot glue. 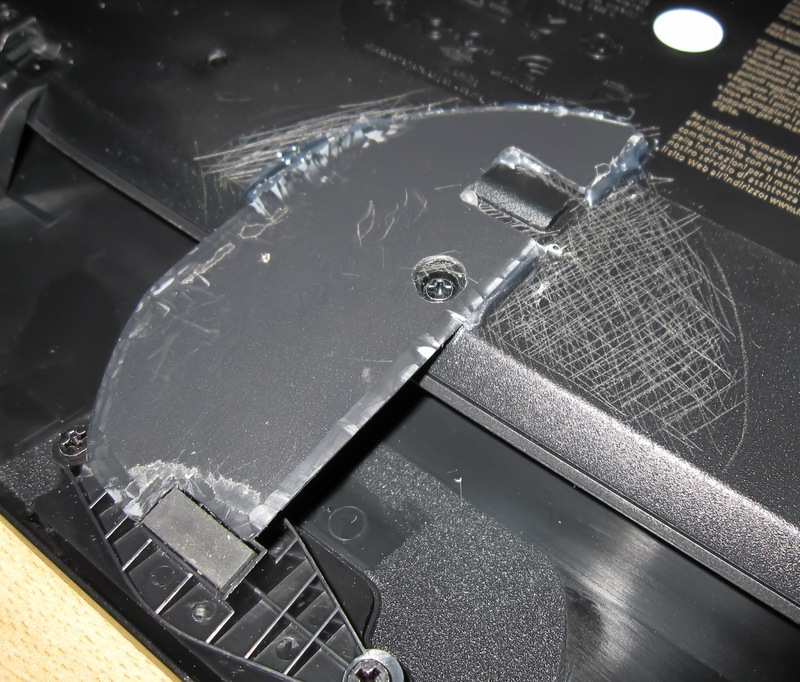 I've scratched the back of the keyboard (the back of the plastic is also scratched) to have better gluing performance. 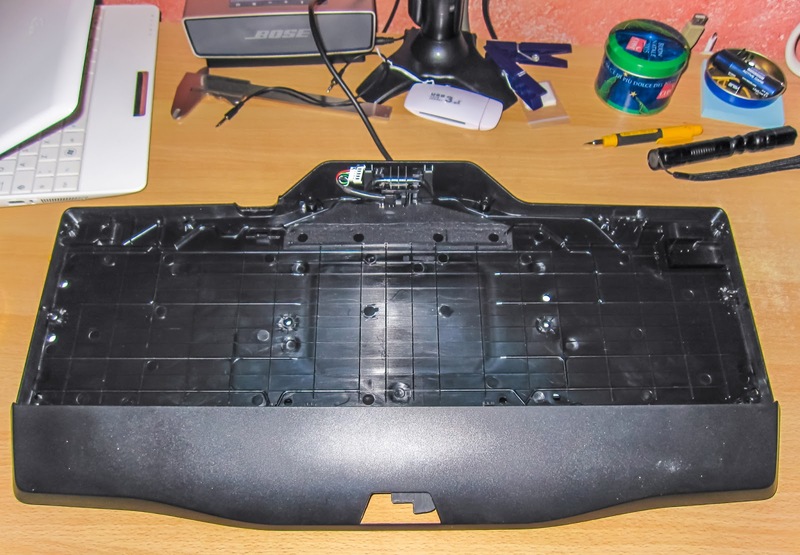 The perimeter of the added plastic is shaved wit a cutter, so that the added thickness won't interfere with the feet of the keyboard. 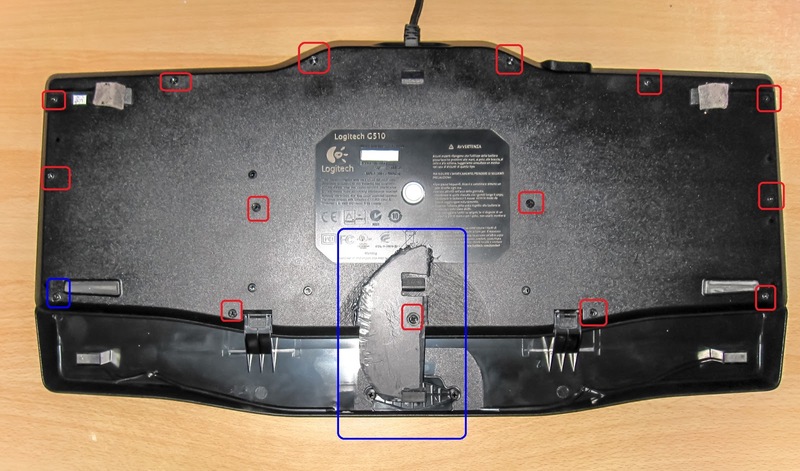 Remove the logitech logo: this is required by the palm rest fix. 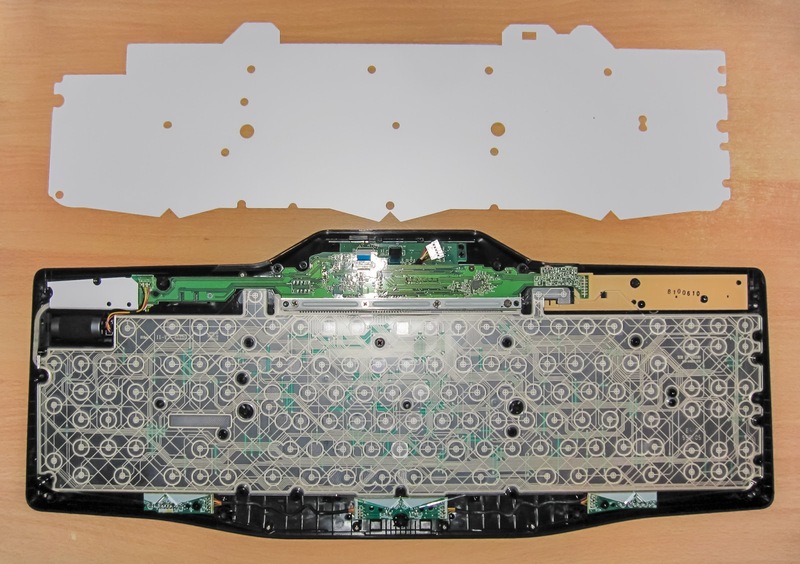 After removing the screws, we can lift up the back of the keyboard. 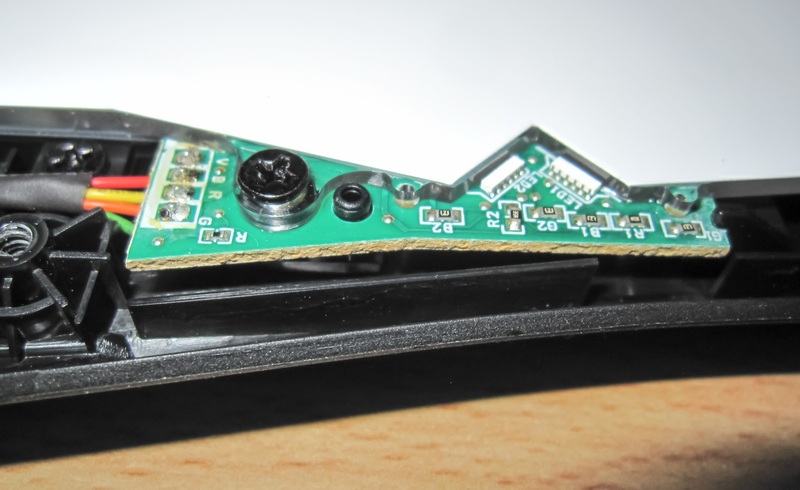 And here is a connector to detach. 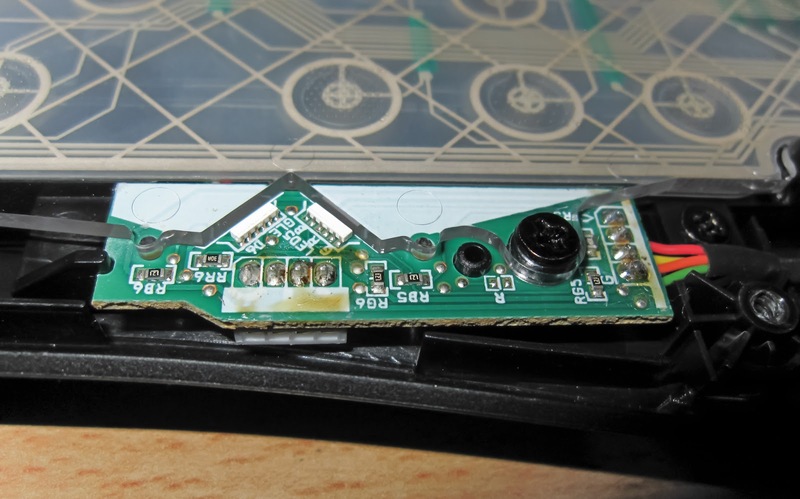 After detaching the connector we can remove the back, and take a look a it... not much to see there. 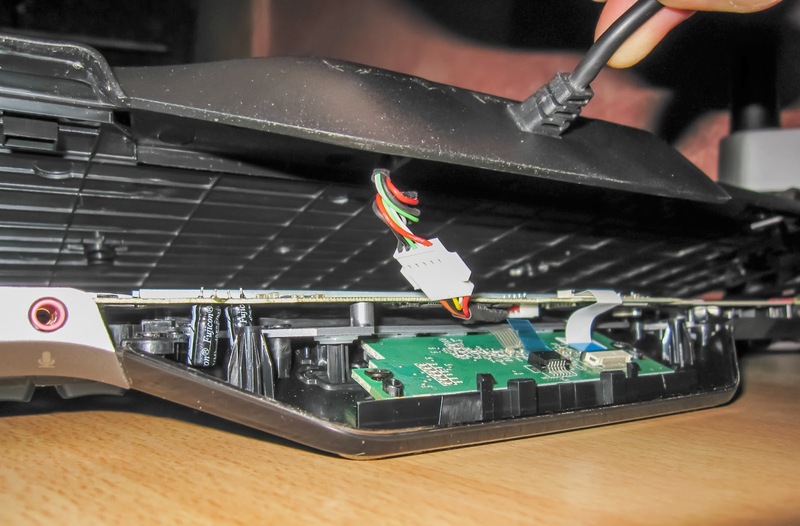 the cable of the keyboard is well fixed. 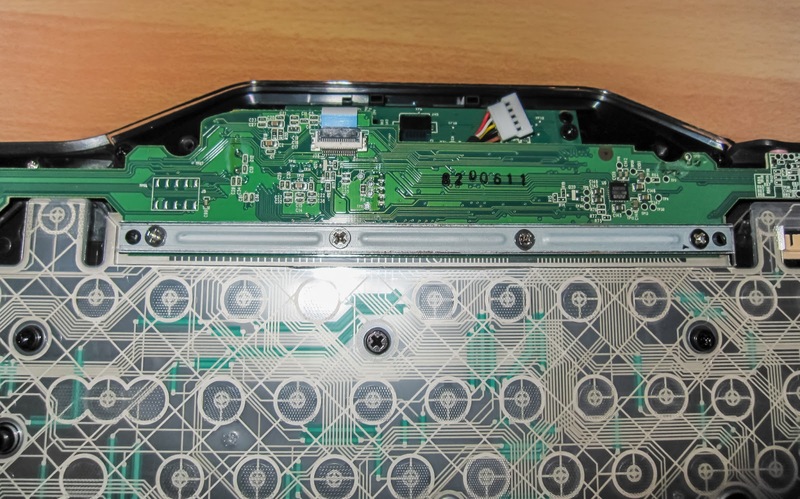 Here is the interesting part of the keyboard. And here is the keyboard with the white reflecting background removed. This keyboard use an light guide to illumination the keys. 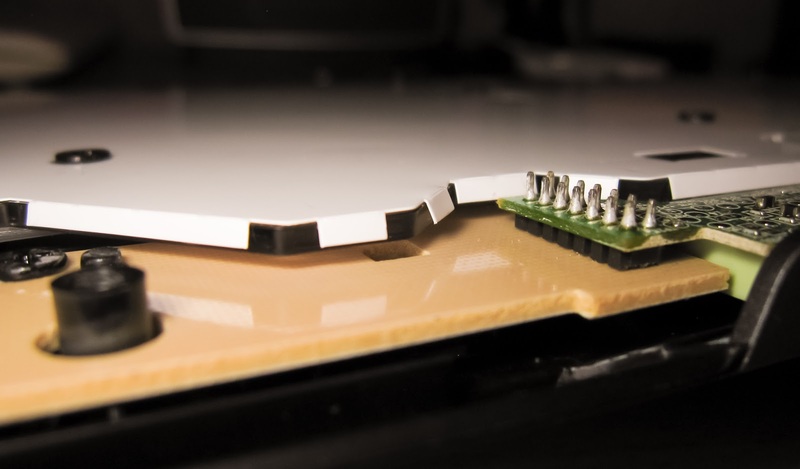 The back of the keyboard is composed by a transparent sheet of plastick thick about 3mm. 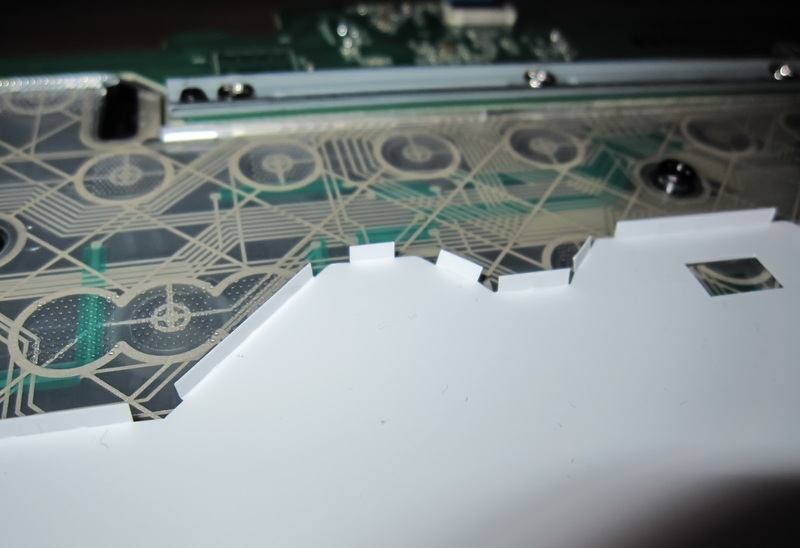 The back (and also the sides) of this transparent plastic are covered with a white background (removed in the above photo). The Leds that illuminate the keys are on the bottom side of this transparent plastic. 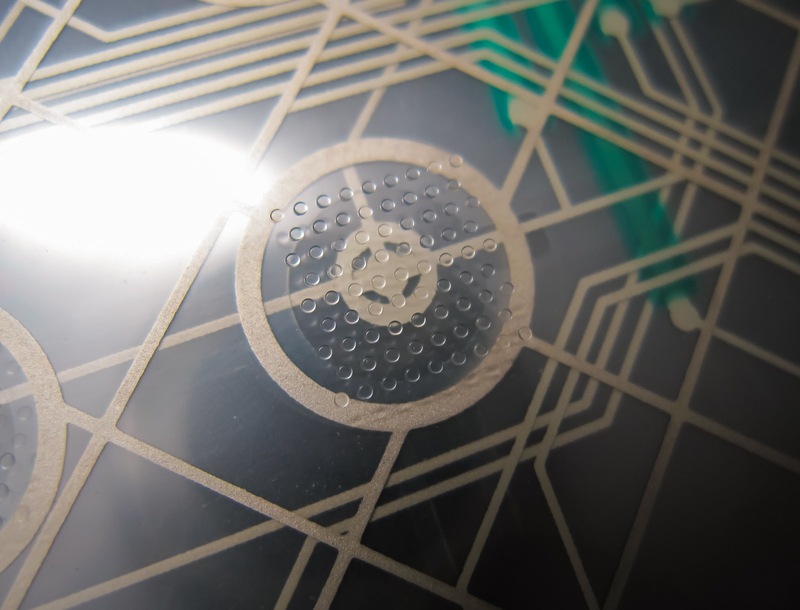 Under each key there is a square "dotted" part of this transparent plastic that help the light to be reflect up through the key. I think that with this kind of illumination system it will be very hard to attain high level of brightness. The fact is that it doesn't seem to be a very efficient way to light the keys. So it is like having 6 leds that try to illuminate a white sheet big as all the keyboard, and then we look at this illuminated sheet through some translucent letter shaped hole on top of the keys. 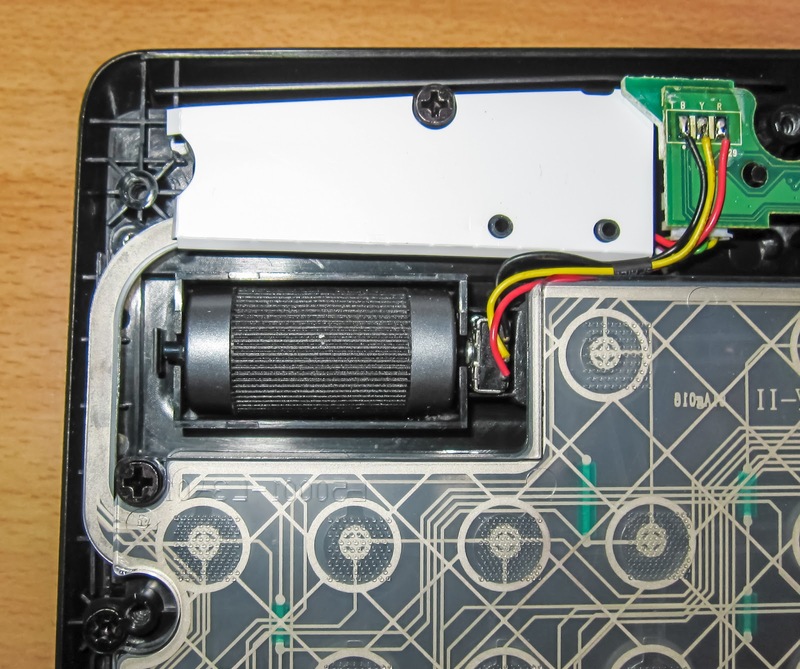 Now, some more images of the G510. 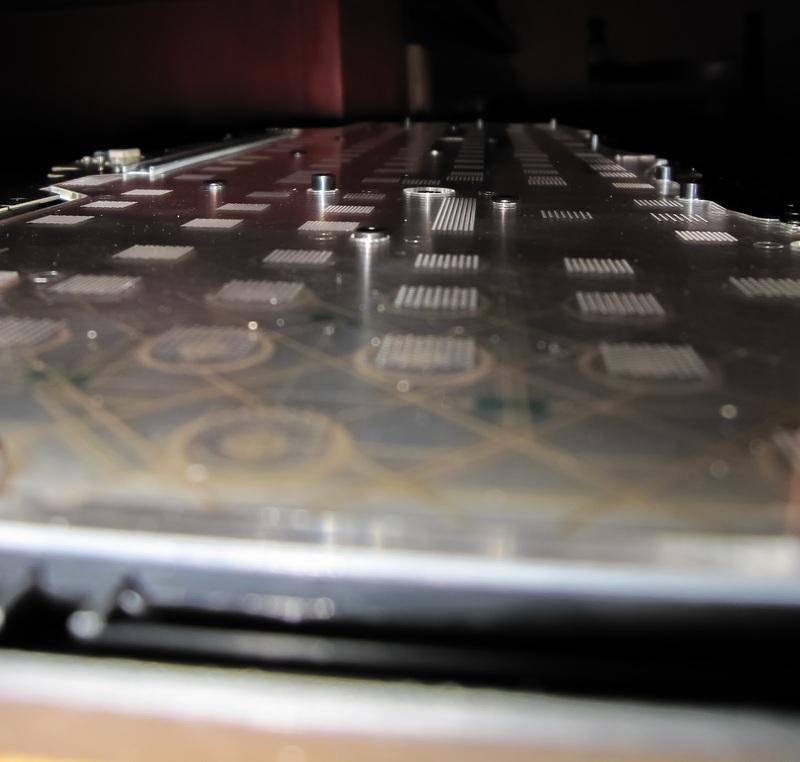 I've counted 6 RGB LED that illuminate the keyboard, these led are soldered on 3 PCB, on the lower side of the keyboard. 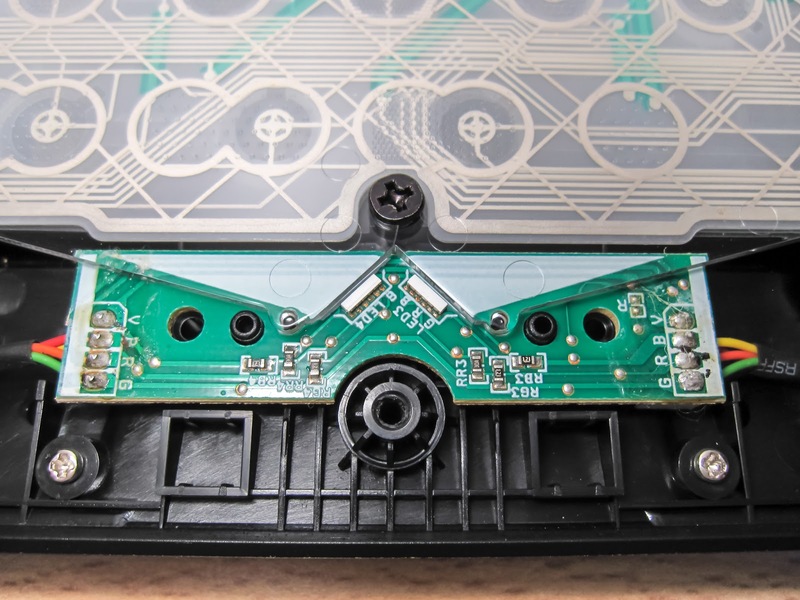 This PCB is interesting, because it seem to have an unused connector (you can see it in the bottom left part of the PCB, in the above image). 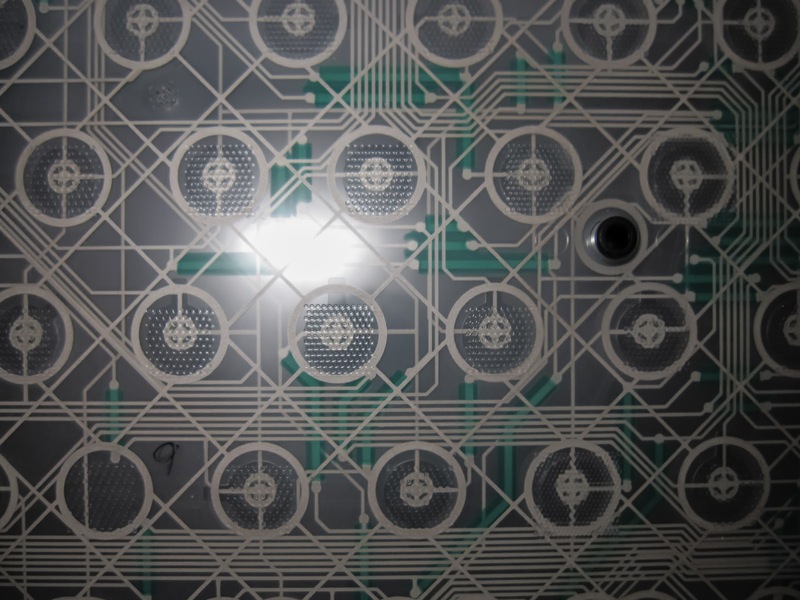 and here is the left PCB, with the last 2 leds. 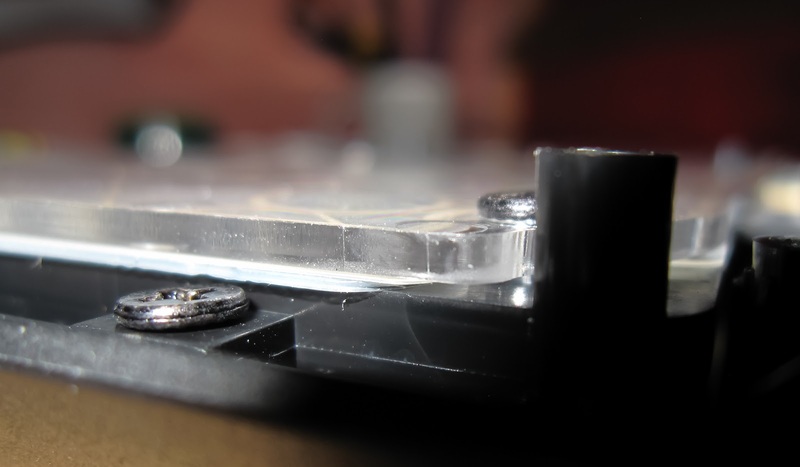 A side view of the transparent plastic that work as a light guide, it's thick about 3mm. 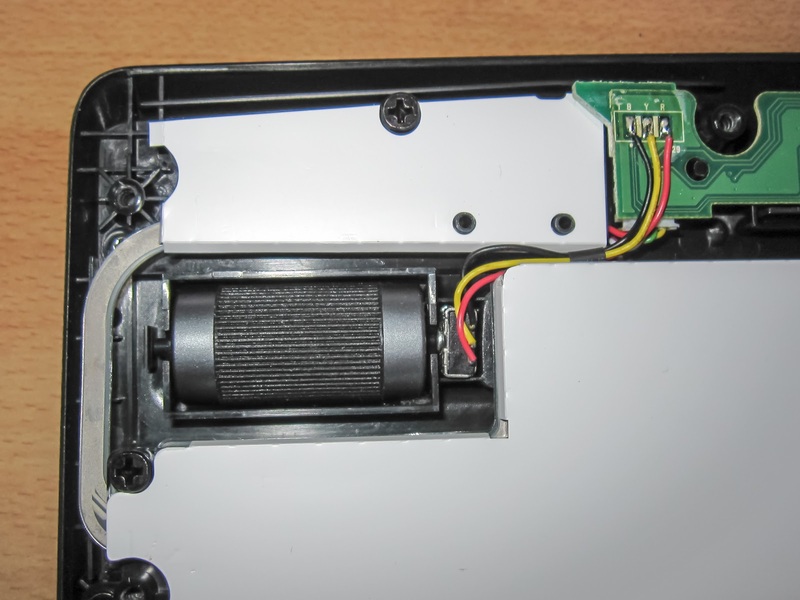 The volume knob, and it's encoder. 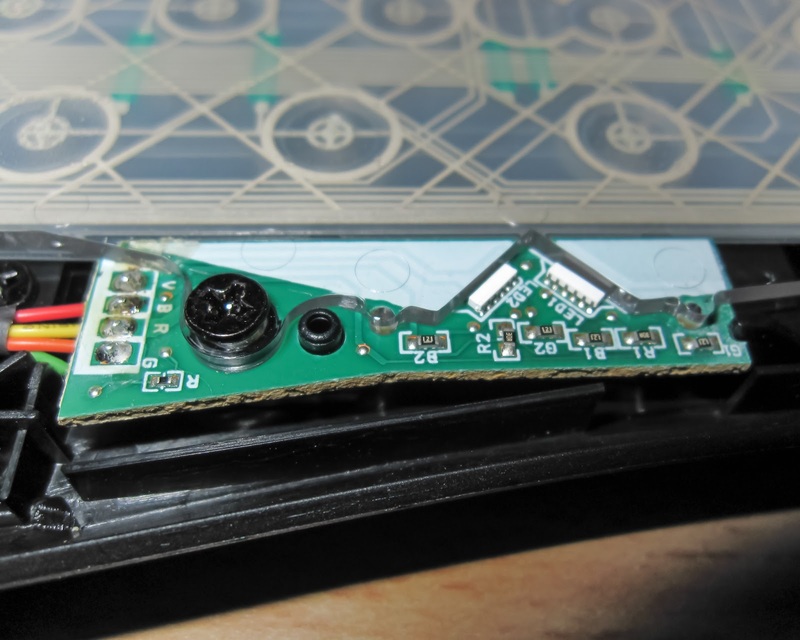 The top circuit board, and the PCB behind the LCD display. Here is the white background placed on the light guide. 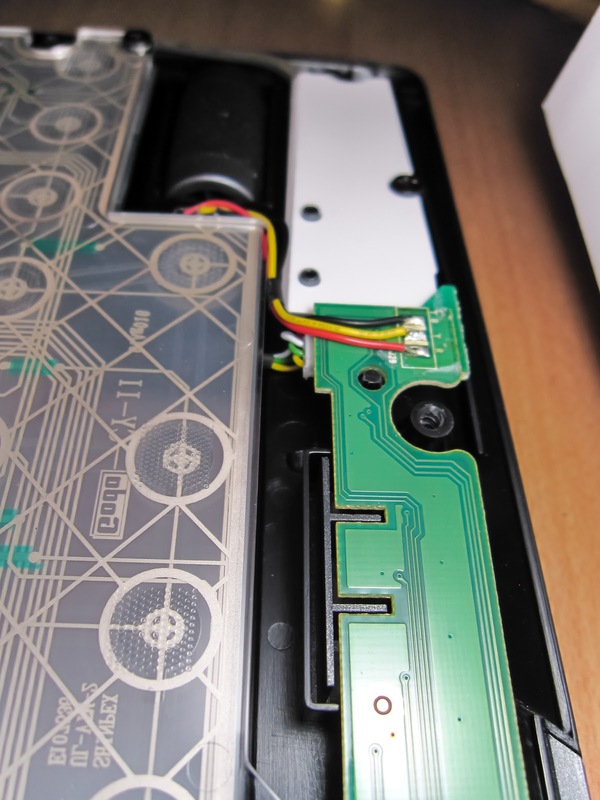 Here you can see the dotted square behind each key, they'll help the light to reflected up through each key. 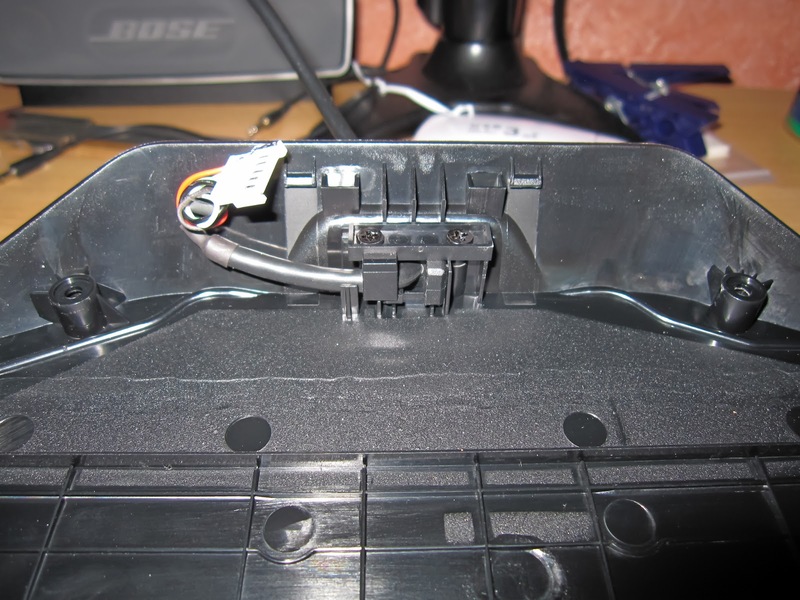 Now I understand why, from some angle, the light from the G510 keys seem somewhat 'dotted'. Here is a frontal view of some of the dotted squares. 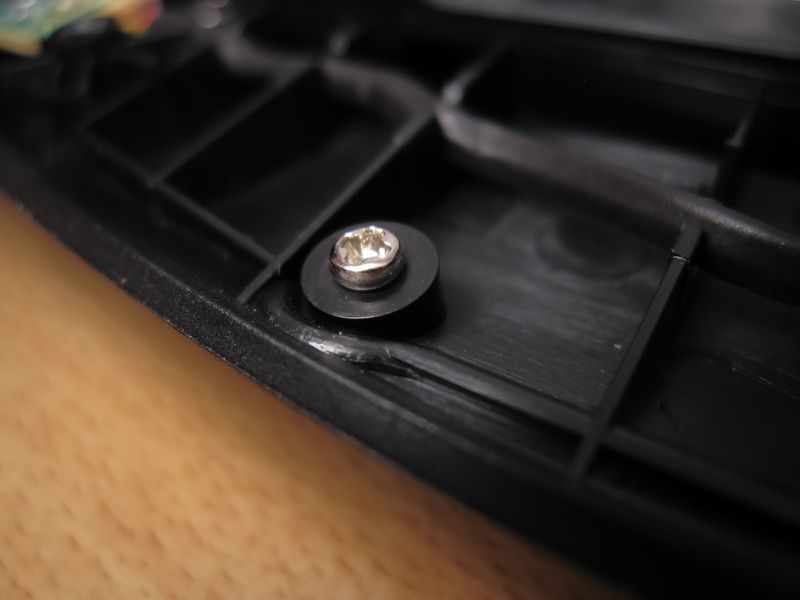 On the perimeter of the keyboard you'll find a lot of these screws, doing apparently nothing... 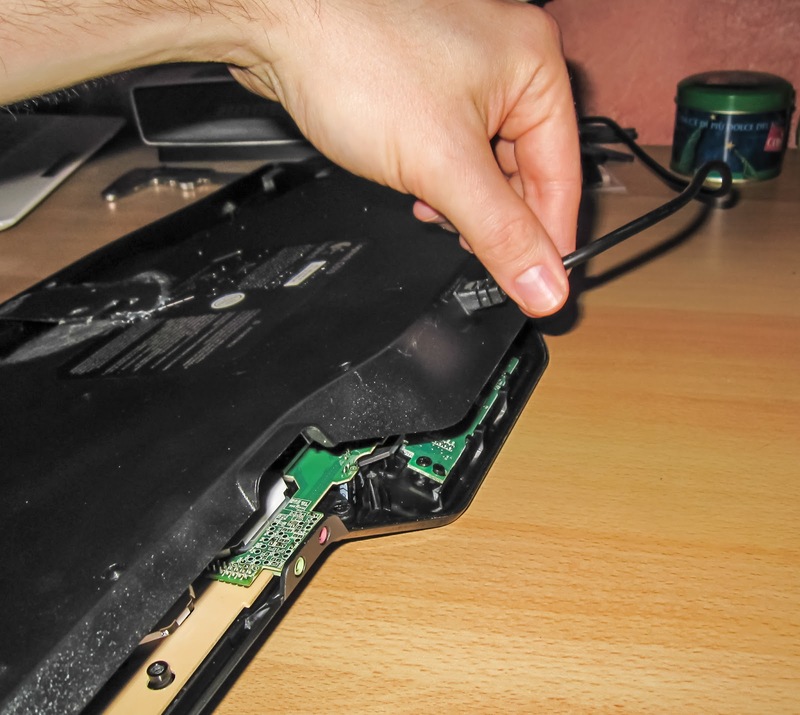 I think they hold the gray plastic on the front of the keyboard. 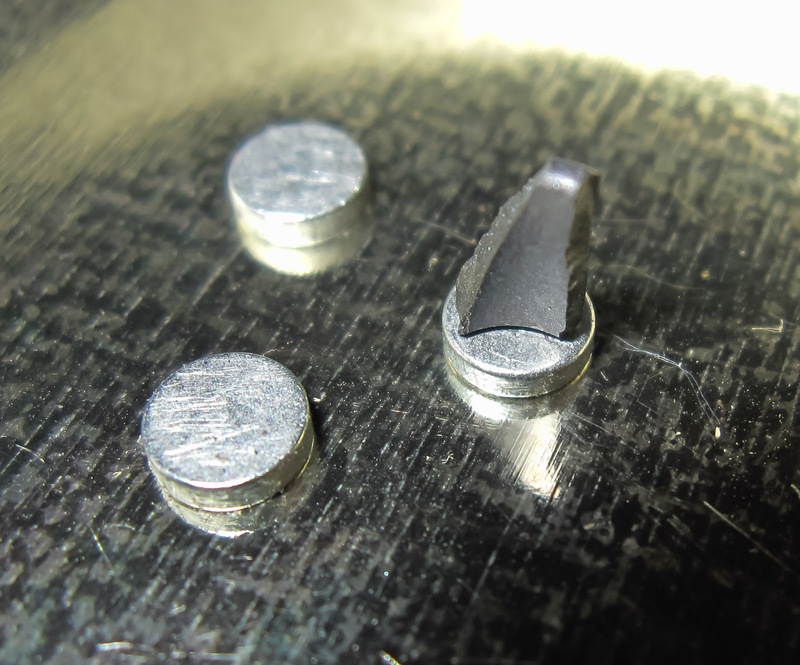 And now a tiny mystery: inside the keyboard I found this tiny piece of ferrite. Where does it came from? I don't know. 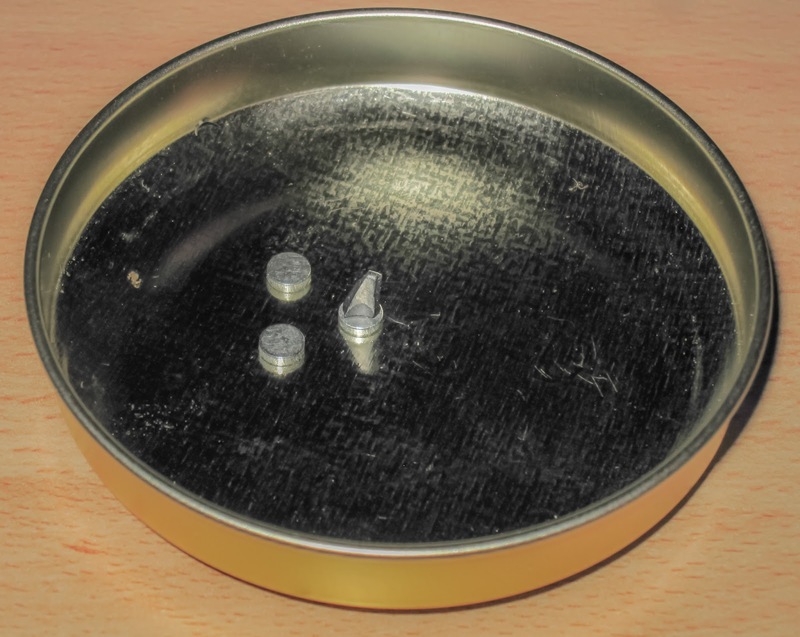 I thought it was plastic... but after reassembling the keyboard, I found that it was attached to my tiny magnets (I use these tiny neodymium magnet to hold the screws when I dismantle somethings). I've looked to all the photos, and I didn't see ferrite anywhere. 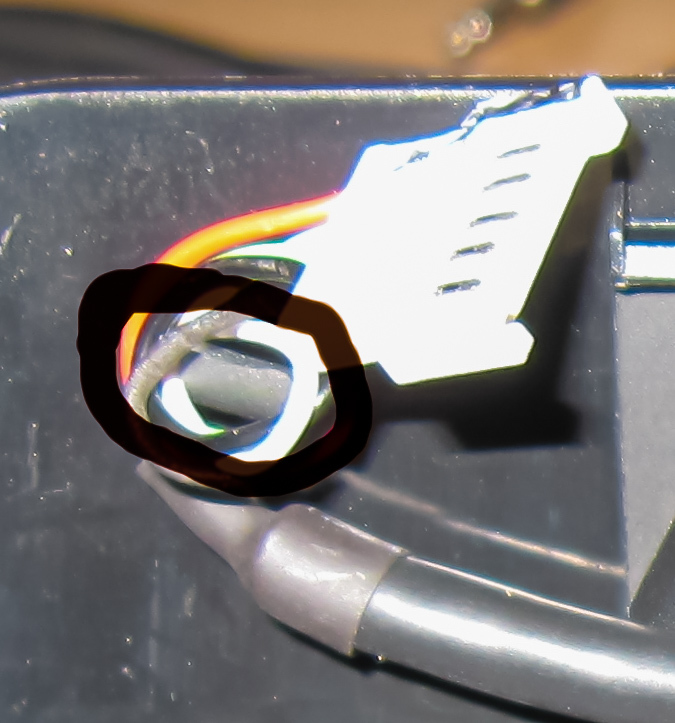 As suggested from an anonymous reader in the comments, the ferrite come from the curly part of the internal usb cable.